Samsung Electronics has developed a new production method that could slash the cost of OLED manufacture and change the face of display production with a 300 per cent improvement in screen functionality. It's a bit heavy (but bear with us), but basically the set of transistors on the back of your LCD/OLED, the TFT, tell the pixels which colour to switch to in order to create the image. These have been made of amorphous silicon previously, which is difficult to produce and prone to failure. 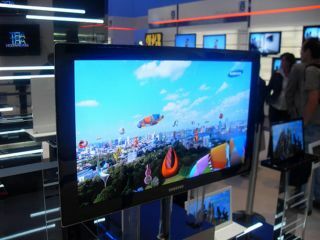 Samsung has now developed amorphous oxide TFTs, which will be three times more effective than current options. And the best news is it can be integrated into current LCD/OLED production, so existing lines can still be leveraged for the savings. And when HD screens eventually move into ultra-high definition, then the technology will also be able to help make that step up too, so the future's sorted as well. "In mid and long term, we will be able to expand its application to semiconductor peripheral circuits in addition to future display to become key technology to semiconductor devices in the future," said Kim, Yung-hwan, Senior Managing Director of Samsung.